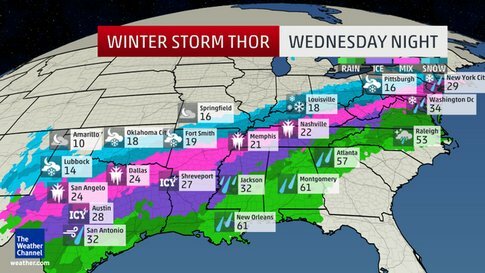 A wild Wednesday is on the way for many in the South as Winter Storm Thor pushes eastward, bringing quickly changing weather conditions. Warmer temperatures have surged north ahead of Winter Storm Thor, bringing hope of spring across much of the South. But don’t put away your winter gear just yet – these warm temperatures will not last long. In fact, many locations that are under winter storm warnings, watches or advisories saw temperatures in the 60s on Tuesday. Plummeting temperatures will lead to rain changing to freezing rain and even snow as Winter Storm Thor unfolds across the South Wednesday into Thursday. A flash freeze is also a risk in some areas. 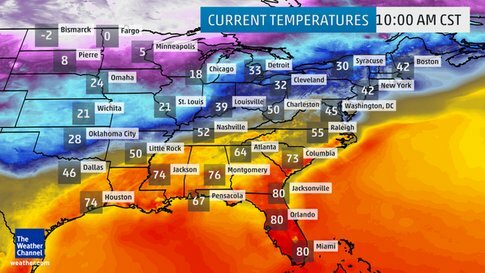 Much of the South will see temperatures drop 30 to 45 degrees in a 24-hour period thanks to yet another arctic cold front. As the arctic cold front advances southeast colder temperatures will begin to wedge into the region and as the temperatures drop towards the freezing mark, precipitation will transition from rain to freezing rain, sleet and eventually with enough cold air snow. Temperatures will start in the 50s and 60s for most locations early Wednesday from central Texas into the Tennessee Valley. However, by Wednesday night temperatures will have plummeted into the 20s, well below freezing. 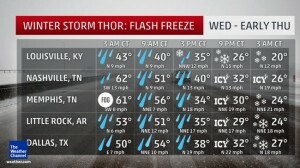 Precipitation from Winter Storm Thor will start out as rain in many Southern cities, with a few thunderstorms possible. But as the arctic front arrives, wintry precipitation will quickly return. Locations from Dallas to Little Rock and Memphis will see temperatures fall throughout the day on Wednesday and the rain will begin to transition to freezing rain and sleet in the afternoon and evening, with snow developing late Wednesday night into Thursday morning. A winter storm warning has been posted for each city, where a few inches of snow may accumulate atop a thin glaze of ice. Nashville will also see falling temperatures on Wednesday with freezing rain expected Wednesday night and the freezing rain will change to snow overnight. Farther north in Louisville, Kentucky, rain will change to snow during the daytime hours Wednesday. The snow will continue through Thursday morning. An accumulation of more than 6 inches looks likely in Louisville as well as much of the Ohio Valley. The rain may end as freezing rain as temperatures tumble below the freezing mark Wednesday night into Thursday morning from Huntsville, Alabama to Austin, Texas, where thunderstorms are likely. The rapid fall in temperature may also cause any water on the roads from earlier rainfall to turn into ice. For those areas, precipitation is likely to end before the whole atmosphere is cold enough to force a changeover to snow. The fast changing weather will mean that the conditions you see for your morning commute will be vastly different than your evening ride home. Check back with weather.com and The Weather Channel for the latest forecast. Behind Winter Storm Thor record-breaking cold will blast into the South through Friday. Numerous daily record low temperatures will be threatened both Thursday, Friday and Saturday morning. A few cities that could see record lows include Little Rock, Dallas, Jackson, Mississippi and Memphis. Some locations may even see their coldest temperatures ever recorded so late in the season, including Nashville andLouisville, Kentucky, where temperatures may drop into the single digits. Places where heavy snow accumulates will be more prone to record-setting cold late this week because snow cover absorbs less energy from the sun during the day and radiates (loses) more energy to outer space at night. The cold temperatures after the snow will also mean less melting of any snow and ice that accumulates. Some locations may not see much melting until the weekend.